This is the first book I have read featuring Jade De Jong, a South African private detective, though it is the third in which she appears. As it opens Jade is in the resort area of St Lucia for a diving holiday with her boyfriend, a policeman. She booked the trip to overcome her fear of diving and to shore up the somewhat rocky relationship with David Patel. But even though she receives private lessons from the instructor she is unable to overcome her fear of drowning and fully embrace the sport and the holiday turns truly rotten when David drops a bombshell about their relationship. Before the two can discuss their future the diving instructor is found stabbed to death and David (with Jade in tow) steps in to help the locals with the investigation. 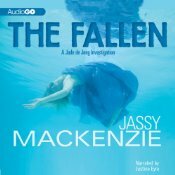 I found the plot of THE FALLEN uneven, slow to get going really as several threads of unequal interest were set up, including a somewhat confusing tale about Jade trying to find the grave of her mother who died when Jade was a baby. For me the pacing was thrown off by the terribly obvious and drawn out clue-hunting, and then at one point I thought the book had finished and was rather astonished to find there were still 6 and a half chapters (a couple of hours) of the audio book left . The thread that deals with what happens after the diving instructor’s body is found – and the truly horrible plan Jade uncovers – was for me the best part of the book; responsible for a genuine OMG moment when it became clear what was going on. I should be fair and say that some of my problems with the book are probably not the author’s fault. The fact is I didn’t really take to Jade De Jong. This doesn’t mean she is a poorly drawn character (objectively I can see she is not and is indeed quite realistic) but I couldn’t summon up much interest in whether or not she got out of her various tight spots and near-death experiences. Just as you sometimes meet someone in real life and know you’re never going to be anything other than acquaintances without really knowing why, I just didn’t particularly like the character from the outset. As the book went on I found reasons not to like her, such as her somewhat hypocritical morality which seemed to boil down to the notion that it’s OK to do bad things (such as kill people) as long as the victims are not innocent (as deemed by whoever is doing the killing), but my not liking her preceded me discovering this about her. I’m not entirely sure this book knew what it wanted to be. At times it read like an old-fashioned whodunnit, though with De Jong making a bit of a fist of the kind of denouement that Holmes or Poirot could perform with aplomb. I cannot possibly, for example, be the only reader to have been internally screaming “there are more than passengers on an airplane you dolt” as Jade very slowly worked this out as if for an audience of dim-witted, third graders. At other times the book read like a modern thriller with loads of action and heroine-in-peril scenarios. Personally I think this aspect of the book worked better, especially as it allowed the author to depict several aspects of modern South African life which was a real strength of the novel. If I could separate my enjoyment of the book from my disinterest in its protagonist I would undoubtedly rate it higher as overall it did maintain my interest, especially with the excellent narration of the audio version from Justine Eyre. But in the end this has to be about my reaction to the book and frankly I can’t imagine myself picking up another book featuring this character (though I would give the author another go if she wrote something with a different character in it or at least taking the lead role). This entry was posted in book review, Jassy Mackenzie, South Africa. Bookmark the permalink. Bernadette – I’m sorry to hear you didn’t like this more than you did. But as I think about it, you’ve hit on something very important in this series. If you don’t like the main character, even if s/he’s well-drawn, it’s hard to get into a novel or series. And this particular series really does focus on Jade de Jong. If you don’t like her, it is hard to really be swept into the novels… You’re inspiring me for a post now, so thanks :-). Interesting review Bernadette. I probably would have given up if I had been in your position although St Lucia sounds nice! I’ve read the first of this series only, and b***** h***, she is still in an on-off relationship with the tedious David! In book 1 I had had it up to here with him as hot & cold (& dishonesty) doesn’t begin to cover it. I also had some problems with the plot in book 1 – which was mainly about Jade’s uncovering what happened to her 12-years-ago dead father, so sounds as if the parental theme has been used twice now from your review — as you found here, there were some good things about the plot in general but some really stupid ones. For example Jade, a licensed PI employed by the police to solve a crime and well aware of the ultraviolence all around, goes into a situation she knows to be dangerous on her own without telling anyone. The thing I liked least about the first book was various depictions of violence (it is called Random Violence) including very graphic descriptions of people being tortured to death, who were not relevant to the plot – these sections were merely there to stoke up the reader’s anger against the baddy etc. So, it seems as if the series has not “moved on” since then, from your review. Pity as Jade is a character with potential, but looks as if she has not learned a lot…. Jade’s entire personal life was a snore-fest for me Maxine – and I did get the impression (via flashbacks and whatnot) that nothing much had changed with respect to this aspect of her character from the previous books. I only read Random Violence and I liked it just as a book to read, to pass the time, not as one to recommend to anyone else. I thought it a page-turner, with action and a plot I wanted to see solved, but no redeeming qualities. There was too much violence, true. I have not read that many books set in South Africa, but would say that Malla Nunn’s books are in no way comparable to this series in any way. And I’ll recommend Nunn’s books to all readers with no question. But not this series. They’re not that different from a lot of thriller-type books, although I thought Jade de Jong a little bit interesting, but not a pillar of integrity. I hoped she developed, but apparently not.. I thought Roger Smith’s Mixed Blood was better – lots of violence but all part of the plot & atmosphere rather than tacked on, and a much more exciting read. I must read another of his, Dust Devils, which is apparently even better. Maxine I have Smith on my list to read and will do so – I must admit I only tried this one because it was available as an audio book and I am in need of a few at the moment because I am busy packing. Sorry that Jade disappointed you… however it is thanks to her that I am published in the USA at at all so I am very grateful that she’s liked by so many readers in your country, and that all the books in the series have received starred reviews from PW, Library Journal or both. I am aware that readers have different tastes though, so I plan from now on, to write a stand-alone novel in between the following books in the series… I hope that you will try these and enjoy them! Well, because of “The Fallen” I will never buy another of your books again. If I wanted to write the ending for a book then I wouldn’t have to buy them. The Fallen was as if you just got tired of writing and stopped with about 1or 2 chapters to go. 1 murder was found to not be related and the readers think they know who the killer is. The scene has been set up for maybe another murder and you just stopped right in the middle of a scene. Jade had the legal problems and you do not know how that turned out and why the policeman was so determined to set her up. Also you do not know what happened to David. Do you think leaving people hanging after they have spent money for your book is funny????? We spend money to read a story not write it ourselves! The company refunded my money when they saw how badly you ended the book and I had not even asked. We thought there was something wrong with the downloading of the book and tried everything to get the whole book to download. Wasn’t a problem with downloading! You just screwed your career with rubbish like that. Absolutely will try the stand-alones. And, yes, readers have different tastes, that is very true. I just finished and now miss The Invisible Ones, especially JJ. I wrote a comment under your review, with which I wholeheartedly agreed. I am glad I read it. Sometimes one feels enriched by having read a book. That was true for me here. I can’t stand David! What an indecisive weirdo! I mean totally not likable, you can really only deal with a guy like that for one or two books tops and then it’s like, just jettison the guy and move on! I love the books and adore Jade. David is not my fave, but he’s interesting and makes you think. I wonder if I was in his situation what I would have done. I don’t think you always need characters you like to make books interesting. Perhaps David’s predicament is too close to home for some readers…?….haha!